Elaine Longtemps’ piece, “Piggy Back”, has been juried into the Allentown Art Museum’s 30th Juried Show, February 1 – April 26, 2009. If you are interested in attending the opening on January 31st, 6 -8 PM, please RSVP by January 29 by e-mailing events@allentownartmuseum.org The Allentown Art Museum is located at 31 North 5th Street, Allentown, PA 18101. Another work by Elaine, “We Are But One World”, shown in a previous SDA blog, will be included in CONTINUUM at the George Segal Gallery, Montclair State University, Normal Avenue, Montclair, NJ, 07042 from March 10 – April 11, 2009. An opening reception will be held on March 14, 2:00 – 5:00 PM. 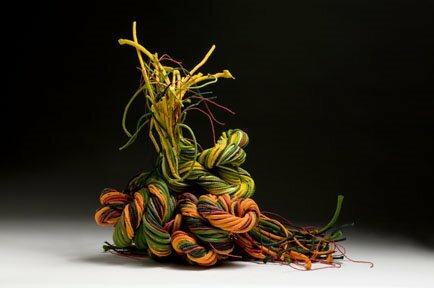 You are cordially invited to attend the opening reception Thursday, January 8, 6-8 PM, for “Economies of Scale”, a juried exhibition of miniature works in fiber created by the artist members of the Textile Study Group of New York at the Phoenix Gallery. Dates: January 7-31, 2009. 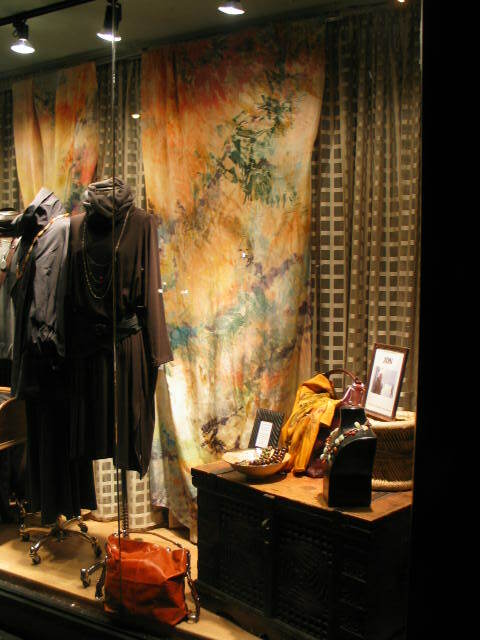 Location: Phoenix Gallery, 210 Eleventh Avenue at 25th Street, Suite 902, New York City. Hours: Tuesday – Saturday, 11:30 AM – 6:00 PM. 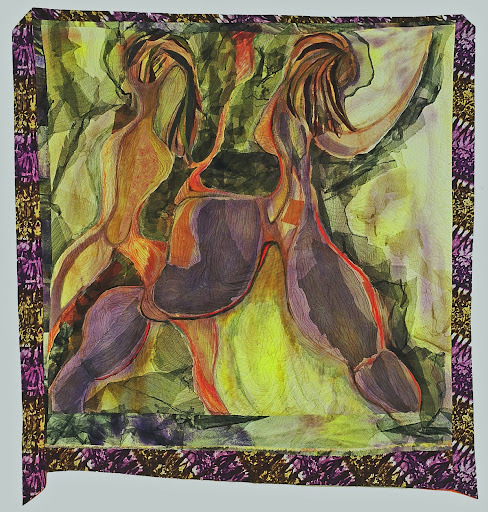 “On the Move” by Linda Abrams, 53″ w x 57″ l.
Linda Abram’s work, “Wild Woman” won an award at the Quilt Nihon Japan, was exhibited at the Metropolitan Museum in Tokyo and has been part of a traveling exhibit. Learn more about Linda’s art and multiple techniques for creating her work by visiting her website. Time to launch an easier way for New York State SDA members to communicate with each other. Using the blog format makes it easy for your state rep to upload images, make comments and edit any mistakes in name spelling or dates, etc. NYS members can even subscribe to the blog and have member news and images appear right in their e-mail in-boxes! I’m hoping this will become an excellent tool for New York SDA members across the state. Blogs are open to any and all who want to visit, and Google will list key words and names in these posts in their search engines, so it may help serve SDA and the artists as a marketing tool as well. So keep your SDA membership current and please continue to send your news and images to me. I am changing my e-mail server to receive your images more easily, so please send future images and correspondence to me at jeannerbeck@gmail.com Many thanks for your participation and support. Correction: Last week’s announcements included a misspelling of Ita’s last name, which is Ita Aber. My apologies, Ita. Elaine Lontemp’s piece, “We Are But One World” has been included in the grand opening of the Escondido Arts Partnership Municipal Gallery in Escondido, California. The show title is “The National Fiber Arts Exhibition,” August 28-October 3. If anyone is visiting that area of California, please see the show and the new gallery. Elaine spent several weeks doing research to select the texts for“We Are One World” and its companion piece “No One Is Listening” for a show in Toronto, Canada. Most of the factual information was very disturbing and some of it tragic. Excerpts were inkjet printed onto fabric, then cut into strips and sewn together randomly with a red cross-stitch. In “We Are But One World”, the colors start out dark and ominous, blacks and deep blood red, the colors of danger, anger, violence, bloodshed, death, negativity, hatred, power, revolt, and aggression, with words describing pollution, contamination, carcinogens, deadly human error and horrible violation of nature. As we try to deal with the problems, the colors change to purple, the color of brotherhood, truth, taking action; olive green, the color of wisdom, acceptance, understanding; magenta, representing tremendous respect for the sacredness of all life, and dark blue, seeing clearly all that there is to see. These colors work their way to orange, the color of joy, deep insight, trust, bonding; turquoise, individual responsibility and humanitarian interdependence; blue, integrity, honesty, diplomacy, negotiation, peace; and green, the point of change, inter-connectedness, balance, love of the Earth and harmony with nature and each other. It is interesting to note that in order to read both sides of “We Are But One World”, one must change one’s viewing position, i.e. change one’s point of view. 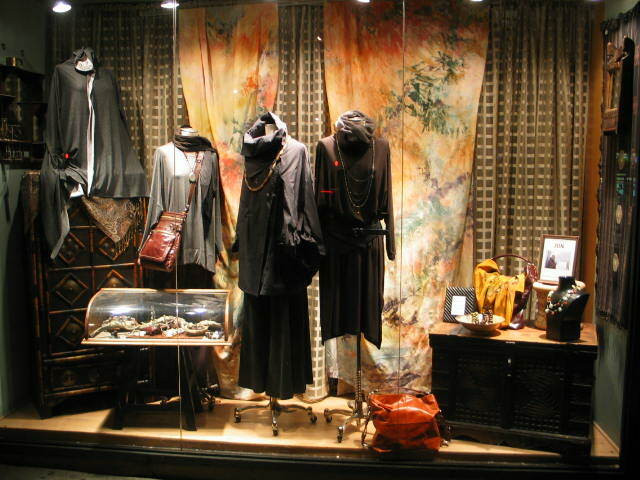 Suzanne Punch, http://www.suzannepunch.com/, has a diptych window installation at Liberty House, a boutique at Broadway and West 112th St. “Autumnal Equinox”, 44″ x 12″ banners, silk crepe de chine, painted with French silk dyes and brushed on gutta resist.